Third milestone of the XWiki Enterprise 3.0 version (Roadmap). 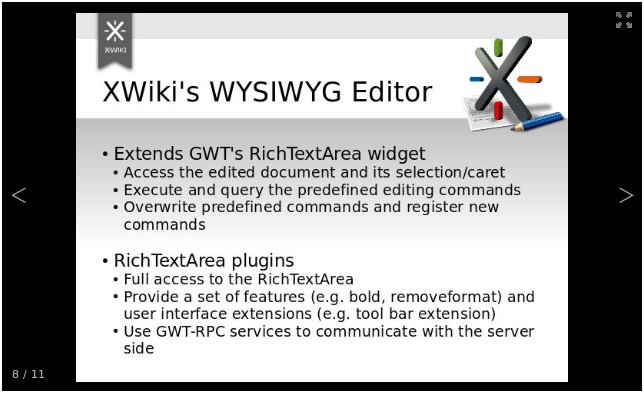 A new gadget can be added by choosing from the macros in the wiki, using a dialog similar to the WYSIWYG editor macro dialog (XWIKI-5940). A gadget can be removed from the dashboard using the gadget settings action (XWIKI-5941). The suggestions proposed come from several sources, configurable in the Administration UI (category "Search Suggest"). The sources configured by default include "Document name", "Document content", "Attachment name", "Attachment content" and "Users". Users can now post status messages which will be visible on the main dashboard and on the user profile. Macros that have output are emphasized only when hovered or selected. You can navigate the macro output with the arrow keys. The macro output feels like the rest of the content except that you can't edit it in place. You can copy content from the macro output. Press Enter to edit macro. Press Space to toggle between collapsed and expanded state. Ctrl + Shift + R reloads the macros. Ctrl + Shift + E expands all/selected macros. Ctrl + Shift + C collapses all/selected macros. Ctrl + Shift + M to open the insert macro wizard. You can cut text from macro output. You can drag text into/from macro output. Placing the caret before/after a macro is still tricky. This is an experimental feature at this stage and the UI part is not done yet. See Extension Module documentation for more details. The goal of this store is to allow very large documents to be added as page attachments in the wiki. The FileSystem Attachment Store is now fully implemented (we were missing the Recycle Bin implementation in XWiki Enterprise 3.0 Milestone 2, see XWIKI-6071 - The Recycle Bin allows users to delete attachments and restore them by rolling back the document and does not depend on the database for storage even of deleted attachments). It's still experimental as we need more feedback on how well it works before we can declare it production-ready. Start your wiki and as Admin, open the <your site>/xwiki/bin/edit/XWiki/XWikiPreferences?editor=object page and scroll down until you find Maximum Upload Size, and change that number to something huge like: 99999999999999999. Then click save at the bottom of the page. Proper rights check for copy page feature. The Copy menu item is now available on any page you have view access. In order to copy the page you must have edit rights on the target space and if the target page already exists you must have delete right on it. The following translations have been updated: de, es, fr, nl, ru, sv. Because of the implementation of XWIKI-5938, when upgrading from 2.x to 3.0, if the dashboard macro was used in its form from 2.5 (with the macro calls in the source of the page), it needs to be manually converted to the objects form.